Razzles! This has been a bad MoFo week for me. My crazy life is getting in the way of my blog. How dare I?!? I’ll try to add a weekend post to make up for it, but who knows. On a random note, I just picked up the Hot Knives cookbook and it looks pretty smashing. Sorry I haven’t given it a thought until now, but now that I have it, it looks deliciously rad. There are some dishes that include cheese, but that’s easy enough to omit or sub something vegan in its place. So I don’t have a recipe for you today, but soon though. Here are some things that I’ve made or am working on but aren’t deserving of their own post yet. That there salad was a vegan version of a meat salad I saw that looked pretty good. I made some “beef style” seitan and marinated it in fresh squeezed orange juice and garlic. 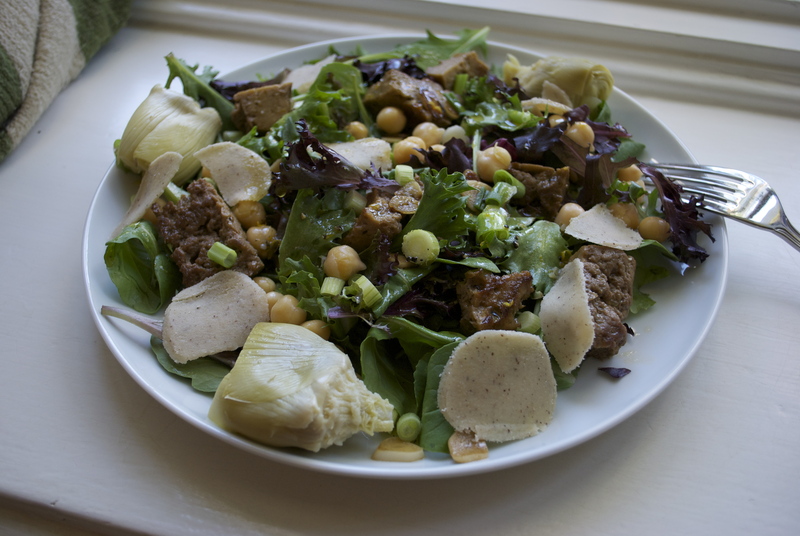 The rest of the salad is sort of a hodgepodge of things; garbanzo beans, artichoke hearts, Dr. Cow, scallions with a citrus-garlic vinaigrette. I made this pizza to try out the buffalo mozzarella from The Cheese Issue of VegNews, which I think was taken from Miyoko Schinner’s Artisan Vegan Cheese. I made the cheddar as well, but my cheddar never solidified to a sliceable solid cheese. It remained a spread…..a delicious spread. This cheese went exactly according to plan. I have to say I loved everything about it…..except the taste. The taste wasn’t terrible…but it didn’t taste like mozzarella to me at all. It was missing the salty savory quality mozzarella can have. It had a great, creamy texture though just like traditional mozz and looked great too. I may try to mess with the flavor just a tad to get it to taste a lil more like mozzarella. Underneath the cheese, I made a puree out of corn and garlic to spread on the pie. 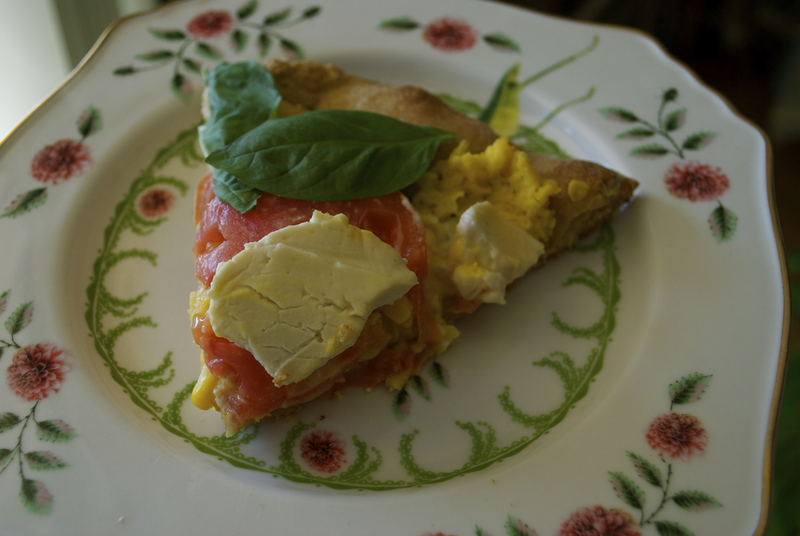 Topped it with fresh basil and heirloom tomatoes. 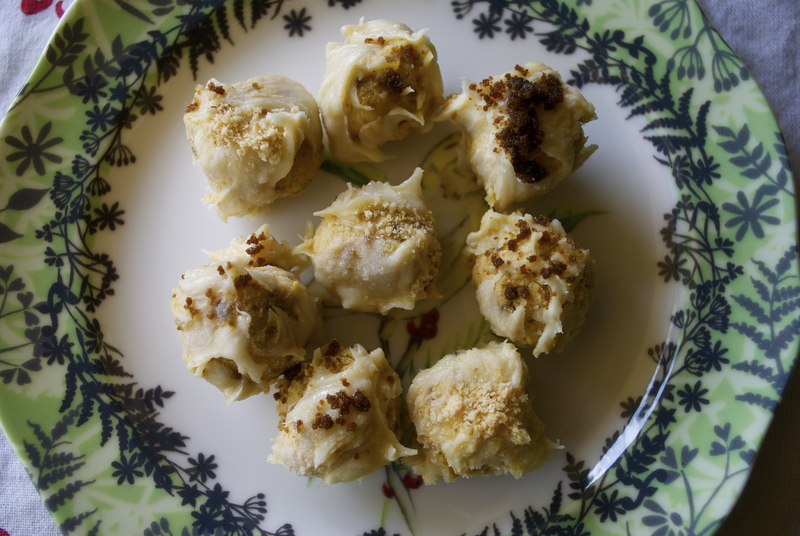 Then there were these pumpkin cream cheese truffles I made from a recipe posted by Whole Foods. Very unvegan, but I thought a vegan version would be super easy. The inside is a mixture of gingersnap crumbs, graham cracker crumbs, fresh citrus zest, white chocolate, pumpkin and vegan cream cheese. Then they were dipped in melted white chocolate and had more crumbs sprinkled on them. These weren’t bad, but they were so cloyingly sweet I could not handle them. I imagine some people would find these lovely and delicious, but I don’t know, I’m not a candy person I guess. I do enjoy chocolate, but with everything going on with these, they were not my fav. Plus, you have to eat them quick as they will start to melt on your fingers. I should have written up a recipe for this one. 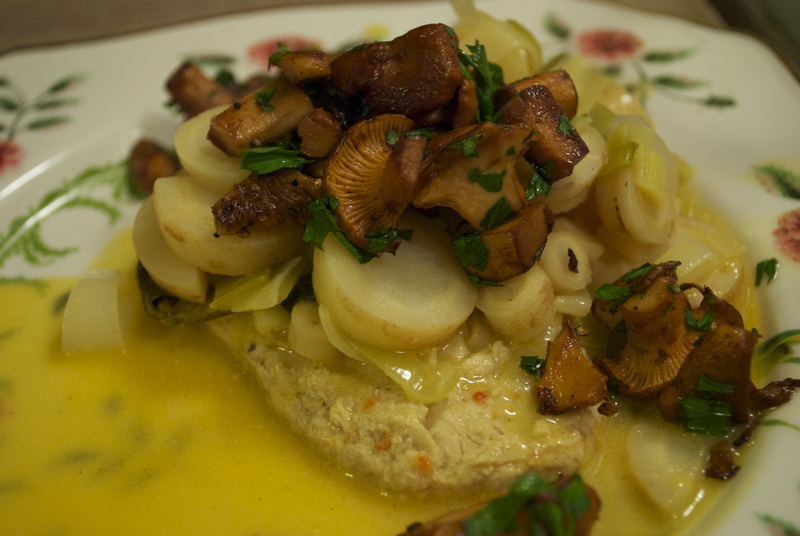 It’s another adaption of a non vegan dish from Sunset Magazine; Chicken Fricassee with parsley root and chanterelles. Fricassee is a French comfort food and I think it refers to a technique of braising meat. I used Gardein for the chicken and made everything else according to recipe, subbing out any dairy for an awesome non-dairy choice. The sauce was a little bit too sweet (primarily made of white wine) so I think I’d tone it down a bit next time. But when you really got a good bite with a piece of everything on your fork, it was pretty delicious. 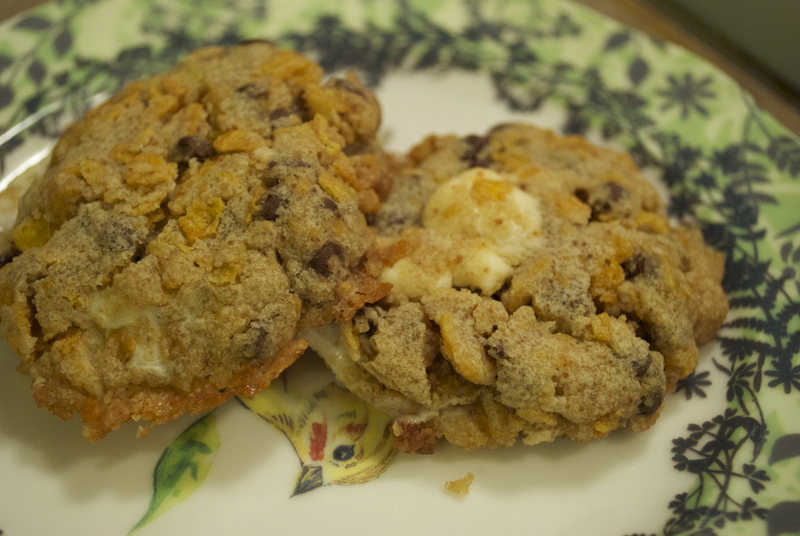 And then….and then there were these Cornflake Marshmallow cookies adapted from the infamous Momofuku Milk Bar recipe. Non vegans love that Momofuku! Some of the concoctions such as the “Compost Cookie” sound a little too over the top for me, but this cornflake marshmallow cookie sounded intriguing. I thought a vegan version would just come right together. Cookies are usually one of the easiest things to make vegan, but these were interesting. First, I did do a couple of edits to the original recipe…The recipe calls for you to sweeten the cornflakes and bake them–I wanted to skip this because cornflakes (organic Trader Joe’s cornflakes that is) are so dang sweet already. This was a mistake because, in retrospect, the flakes need to be baked to get them extra crispy and to keep them crunchy. My flakes didn’t get soggy in my cookie, but some were crunchy and some were chewy. I also need to mess with the ratios on this one a bit. The original recipe instructs you to pretty much find the fattiest, richest butter ever and well, you know, I used Earth Balance. I could try a mix of Earthy B and coconut oil in the future…there’s always shortening too, but I generally like to keep that stuff out of my cookies. In the end, these were still delicious, but they need tweaking to get them where every cookie-loving vegan would want them. Alright bloglings, I am off now. If I have time later tonight, I will write up some posts for tomorrow and Sunday. I have a Strawberry-Habanero pie that need its picture taken….and a pumpkin pie made of fresh heirloom pumpkin–that I picked myself of course. I do have lots to post, so let’s hope I get ‘er done! ← Apple Sour Cream Pie. I keep hearing about Momofuku, all their recipes sound crazy + good. Those cookies turned out pretty fantastic, I’d have no problem whatsoever chowing down on some of those. Even though the compost cookies sound like they could be gross to me, I am now toying with the idea of making them. Some of those recipes just sound so good! Such a beautiful post – this is why I love your blog. You’re such a good cook and writer and you share about interesting dishes instead of the same ol’, same ol’. Thanks for the tips about the cookies. I believe I would have behaved just as you did, for the same reason. I have a bag of Dandies that desperately needs to get used. Thank you so much. I’m so glad you left this comment–it brought me so much joy. I will try and update the cookie recipe as I work it out. I’m one of those people who hates to sweeten something that is already sweet. Gah, I LOVE Dandies! or marshmallow anything really! That chanterelle dish looks beautiful, but I’m especially excited about the Strawberry-Habanero pie. Sounds quite amazing. Yay! I loved your post SO much!